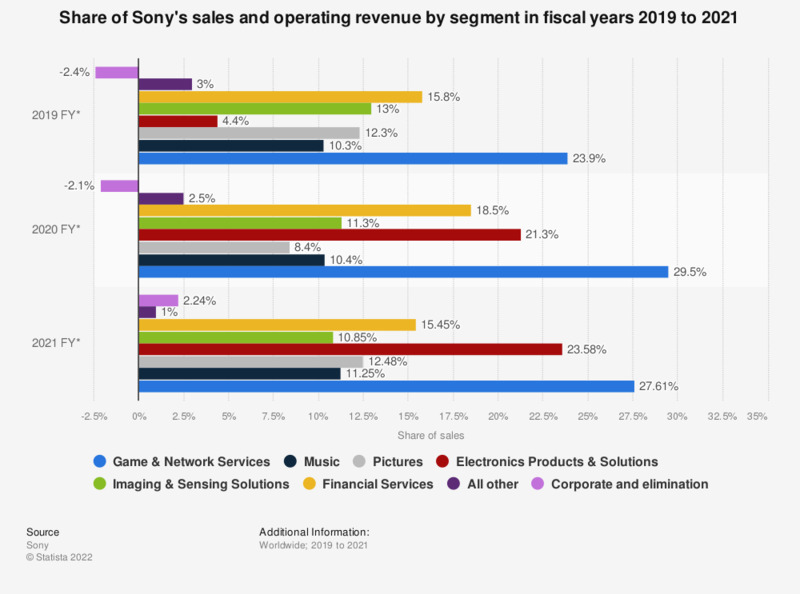 This graphic shows a distribution of Sony's sales and operating revenue in the company's 2017 fiscal year, broken down by business segment. In that year 8.5 percent of the company's sales were through the mobile communications segment. Sony announced total revenue of 75.5 billion U.S. dollars in 2014, the highest the figure has been since 2008. Of this revenue in 2014, over 21 percent, equivalent to 15.83 billion U.S. dollars, was generated in mobile products and communications. This segment is controlled by Sony Mobile Communications which now focuses exclusively on the smartphone market under the Xperia name. As of the final quarter of 2013, Sony Mobile Communications held a 2.1 percent share of sales in the global mobile phone market, which amounted to the sale of 10.38 million mobile phones to end users worldwide. Other lucrative markets for Sony were the Home Entertainment & Sound and the Game sector, which were responsible for 15.3 percent and 12.82 percent respectively of the Japanese company’s total sales in 2014. These two segments generated combined revenue of over 20 billion U.S. dollars. One of the key subsidiaries in this area is Sony Consumer Entertainment, which handles the development, production, and sales of both hardware and software for the PlayStation line of home and handheld video game consoles. In 2014, Sony sold a total of 17 million units of consumer entertainment systems (PS2, PS3, and PS4) worldwide, as well as 3.5 million units of portable entertainment systems (PS Vita and PSP). Despite its market share falling by more than half to 6.3 percent since 2008, Sony also remains the fourth largest vendor of LCD TVs worldwide. The sale of Sony LCD TVs stayed constant at the beginning of 2014, with 3.6 million units sold worldwide in each of the first two quarters. However, sales of the company’s digital cameras have decreased steadily from 4.1 million units in the second quarter of 2012 to 2.2 million units two years later. Thailand: Which of the following electronic products do you own?